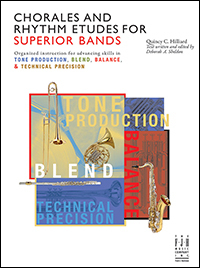 Chorales and Rhythm Etudes for Superior Bands follows the same sixteen-week instruction calendar found in Superior Bands in Sixteen Weeks, making it a great companion resource for directors who have already discovered the value of Quincy C. Hilliard's teaching concepts. It is designed to develop skills in musicianship that focus on tone production, balance, blend, and technical precision. The book can be effective in small or large ensemble settings, sectionals, and private instruction. Get your free review copy!